IREM Sustainability books, courses, forms, and webinars will help you expand your skill set and provide resources for every step of your career development. No matter your level of experience and expertise. 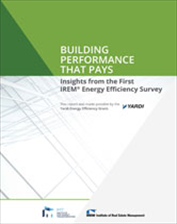 The first IREM Energy Efficiency Survey, conducted in 2016, asked respondents about their building energy efficiency perceptions and practices. This report focuses on survey questions related to financial analysis of energy efficiency and presents insights on financial analysis methods, barriers to energy efficiency, financing of energy projects, and other topics. Read the report to benchmark your own sustainability practices and learn ways to move towards greater cost-saving energy efficiency for your real estate portfolio. 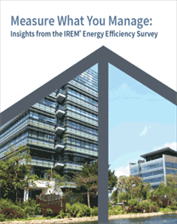 The IREM Energy Efficiency Survey asks respondents about their building energy efficiency perceptions and practices. This report explores 2017 survey data related to energy benchmarking and its barriers. Read the report to assess your own practices and discover ways to establish a successful benchmarking program for your real estate portfolio. Click here to read and except from the book. 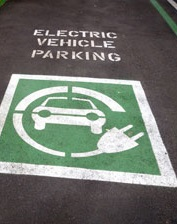 Property owners and managers are being asked about the availability of EV charging stations on their properties. Given the complexity of a new technology, and emerging business and operational models what decision makers need is a simple action plan that streamlines the information required to make a decision about how to deploy charging stations. In this one-hour course, John Kalb, Founder of EV Charging Pros, details 7 simple steps that lead to a decision about EV charging. Mr. Kalb explains what information is required, how to asses that information, and formulate a plan for any property. In addition, he reviews industry trends, business models, and case studies. Reviewing a snapshot of the electric vehicle and charging market trends, including initiatives by market participants that are driving the market. Understanding the different models for setting fees and transaction models between the driver, the charger vendor, and building hosts. Understanding site selection considerations, including requirements for accessible charging stations. Have you been meaning to research your energy efficiency options but aren't sure where to start? Or have you been wondering if you are maximizing the energy efficiency resources available to you? The good news is that you don't have to become an expert to get started or to review where you are in the energy efficiency journey. This one-hour course will cover the nuts-and-bolts review of building energy efficiency and utility incentive programs. Understand the major benefits (energy and non-energy) of implementing energy efficiency projects so that you can communicate them to your audience. Understand the main categories of building energy efficiency and their terminology – know what you are asking for. Identify the next steps for your particular building or portfolio. Commercial Property Assessed Clean Energy (PACE), is a fast-growing, innovative financing program that allows energy efficiency, water conservation and distributed generation improvements to be made to existing commercial, industrial/manufacturing, institutional/nonprofit, and multi-family properties. Share how the Texas PACE in a Box model program enables property owners and managers to upgrade facilities with energy and water saving measures that increase cash flow and pay for themselves with utility savings. Discuss the TX-PACE program design, underwriting criteria and uniform technical standards and identify the elements of a PACE project that assure success and minimize risk. Demonstrate how a property manager utilized PACE to upgrade an office property and increase cash flow in a manner that is replicable and scalable. 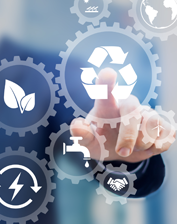 In the ever-changing world of property management, sustainability has become one of the most relevant topics for both landlords and tenants. 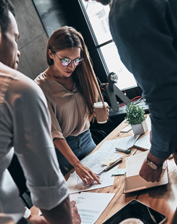 Whether the landlord is dedicated to sustainability to support the company’s goals, to meet jurisdiction requirements, or to enhance marketing efforts, tenants need to buy-in to sustainability for the landlord to have a successful program. This webinar will walk you through ways landlords can require and encourage tenant participation in sustainable programs. Lynne Miller is a Director – L.A. Property Management Division with Charles Dunn Real Estate Services, Inc., overseeing office, medical, industrial and retail properties. Her responsibilities include supervision of portfolio managers in all aspects of the day-to-day operations, maintenance and financials of properties totaling almost 3 million square feet. With over 20 years of property management experience, prior to joining Charles Dunn, Lynne managed a 1.4 million square foot office building and parking garage in downtown Los Angeles for seven years for Maguire Properties. From 1998 to 2006, she managed several office, industrial and medical buildings in the Greater Los Angeles area for PM Realty Group and Arden Realty, Inc., and a 1 million square foot office building in downtown Los Angeles for Cushman & Wakefield. Lynne holds the Certified Property Manager®, Real Property Administrator® and LEED® AP O+M designations as well a California real estate salesperson license from the Department of Real Estate. In addition, she received a Master of Business Administration from the University of Phoenix and Bachelor of Arts degree in English from the University of Maryland.